Last night the an­thro­pol­o­gist Richard Sen­nett talked to the philoso­pher Richard David Precht on the main stage in the Haus der Berliner Fest­spiele about his new book To­gether: The Rit­u­als, Plea­sures and Pol­i­tics of Co­op­er­a­tion. The event took place as a part of the International Literature Festival and brought together many people curious to experience the scholars in person and to find out more about the nature of cooperation as a social process and about the exclusively human problems of living together on a daily basis. The conversation was held in two languages and translated simultaneously. It clearly pointed out to the differences of academic discourses within these two cultural and linguistic environments. Sennett spoke slowly and always made his points very clear using examples from other disciplines and arts. Precht spoke fast, made use of monster compounds and long sentences typical for the German language and drew many references to the history of mankind and philosophical theories. Both of them showed their sense of humor and made it a highly interesting and very inspiring hour and a half. “If I was to write the book a year later, I would have written about the European crisis” started Richard Sennett when introducing his newly published work. So it would have been about the crisis because it perfectly illustrates the theory that our societies are characterized with lack of social understanding of the Other and of what cooperation is about. One of his main points is that cooperation is founded in natural behavior and that it is not ethical – i.e. we need to cooperate in order to survive. We would not be able to learn anything if we did not cooperate with our teachers. Our skills of cooperation tend however to be very weak if we have to use them towards people who are different than ourselves. It is easy to be nice to people who are like us, claims Sennett but what is a real challenge is to develop a skill to cooperate in order to cross cultural borders. According to him, this very skill is a bridge, a mediator between the natural and the cultural. Cooperation does not equal ethical behavior, nor is it based on altruism (which does not involve an exchange and which is not dialogic) and insofar it is against the principles of protestant ethics. Precht adds that we do not always cooperate for economic purposes, i.e. there is not always a cost-benefit-analysis that can be conducted as a result of cooperation. He points to the fact that this very nature of our mutual coexistence has not been thoroughly discussed as yet. When he asks Sennett, whether maybe sociology had an explanation of this purely human phenomenon, the answer is “Never!” followed by a charming laughter and expression of his attachment to anthropology rather than sociology. What distinguishes us from other animals, claimed further Precht, is the ability of recognizing the intentions of other people even if they are not being verbalized which makes certain kinds of cooperation possible or impossible. We are also capable of rewarding ourselves - we do not necessarily need other people to do it for us, what according to Precht draws on Kant’s idea of moral imperative being within us. We are also capable of fiction, meaning that we can convince ourselves about certain personal qualities and believe in them in order to feel better about who we are. All this does not exactly make any kind of collaboration any easier. Cooperation is a process of exchange that does not always end in success. Understanding this means that one cannot judge the quality of cooperation by its positive results. Sennett mentions here his experience as a UN diplomat and recalls endless discussion led between representatives of countries in which a solution or a common position could never be reached and yet they had to be continued for the sake of staying in touch and of showing mutual respect and the will to cooperate. In politics, just like in any other field, cooperation is about acknowledging differences and coping with them so that they can coexist in order to form a coherent entity. Here, Sennett refers to musicians in an orchestra who all play different instruments so very differently and yet after learning how to rehearse, they can all contribute to a coherent sound. This metaphor can also be related to the European Union whose strength should be seen in its diversity. The lack of intercultural bridge-building skills makes this diversity a reason for an international crisis. The second part of the discussion was devoted to social media and their influence on the development of social skills. According to Sennett, social networks like Facebook that started as dating services and platforms for self-creation and display “in order to meet someone from Harvard”, should but do not make us more cooperative. For its creators and developers, Facebook has primarily had a commercial use. This stopped being the case when it was used for political purposes, e.g. in the Arab Spring. No one in Libya is going to buy what is being advertised on the social network’ page, claims Sennett. Precht stresses here the fact that in the history of mankind technology was used in order to survive whereas culture defined social life. Nowadays technology tends to replace culture in this context. We become more and more addicted and dependant on different devises which functions create solutions to problems we did not have before the technology had been developed. Why to create an app that will tell a woman when she is fertile if she can find it out without it? Introduction of new functions to a mobile phone or the future can-do-it-all-device can also make some cultural practices vanish. GPS is right now killing the flâneur in Benjamin’s sense, says Sennett. Becoming dependant on more and more technological inventions, we have the impression of getting more independent from other people what in a longer run can make us very lonely and diminishes our social skills, also the crucial one: to cooperate with others. 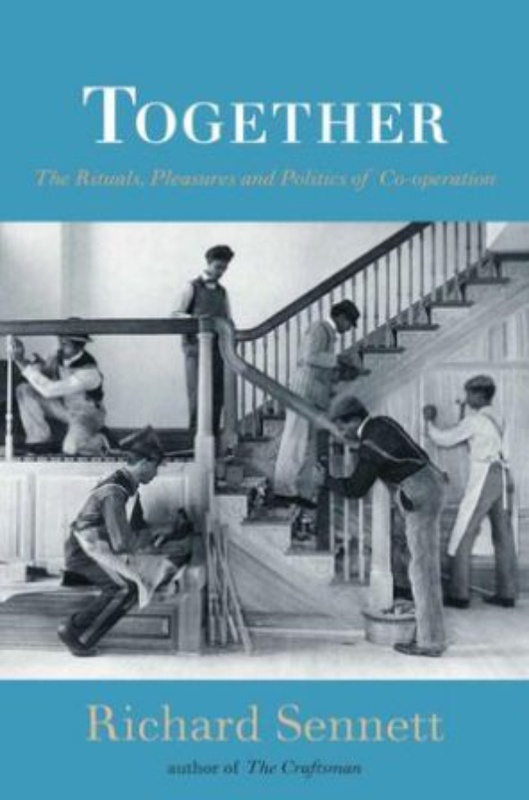 Richard Sennett Together: The Rituals, Pleasures and Politics of Cooperation. Yale: YUP 2012. German edition: Zusammenarbeit - Was unsere Gesellschaft zusammenhällt. translated by Michael Bischoff, Hanser Verlag 2012.